Stocks are higher even as geopolitical worries spike. Here's where stocks are trading shortly before Friday's close. The unstoppable bull market reached new intraday records on Friday, Sept. 15, even as geopolitical worries spiked following another North Korean missile launch and a terrorist attack in London. The Dow Jones Industrial Average rose some 0.25% to an intraday record 22,265 with less than an hour left in the trading day. The S&P 500 was also up 0.1% to 2,498 after earlier hitting a 2,499 intraday record, while the Nasdaq was up 0.3% at 6,447 after earlier reaching a 6,464.27 new intraday peak. Even singer Jason Derulo thinks the iPhone X costs too much. Semiconductor stocks, such as Nvidia Corp. (NVDA - Get Report) , Advanced Micro Devices (AMD - Get Report) and ON Semiconductor Corp. (ON - Get Report) were among the tech sector's best performers. Conversely, Oracle Corp. (ORCL - Get Report) fell 7.2% after the computer software giant signaled slower growth in its cloud business. The stock initially rose after Oracle on Thursday reported better-than-expected earnings and revenue for its fiscal first quarter. But then ORCL declined after the company said it only expected total cloud revenue to increase 39% to 43% in the fiscal second quarter, down from last quarter's 51.4% growth. What TheStreet's Jim Cramer thinks of Oracle's results. The airline sector was also under pressure Friday after JPMorgan downgraded American Airlines Group Inc. (AAL - Get Report) and United Continental Holdings Inc. (UAL - Get Report) to neutral on weaker pricing and higher fuel expenses. Analysts are uncertain the two airlines can meet fourth-quarter estimates. American declined 0.77% while United slid 2.48%. Carnival Corp. (CCL - Get Report) also slumped 4.4% after Credit Suisse downgraded its rating on the cruise company to neutral from outperform. The firm sees Hurricane Irma's damage in the Caribbean hurting demand for the cruiseliner. Terrorist attacks and the North Korea threat could contribute to problems. An explosion on a London Underground train Friday morning was declared a terrorist incident by British police. 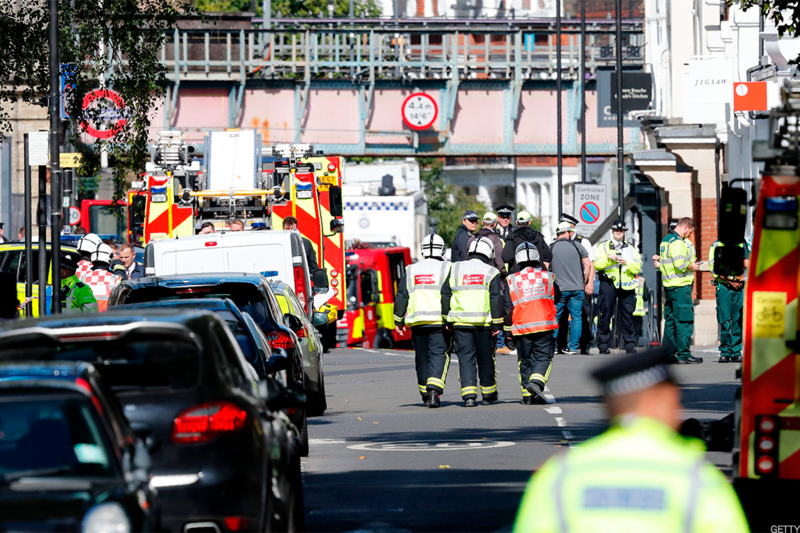 At least 23 people have been injured when a possible explosion took place on the District Line at the Parsons Green stop in West London. Reports indicated the explosion was caused by a homemade bomb placed into a bucket. In a statement following the incident, London Mayor Sadiq Kahn said the city would "never be intimidated or defeated by terrorism." He added, "I urge all Londoners to remain calm and vigilant." Scenes from the latest U.K. attack. Meanwhile, North Korea again ignored international calls to cease its ballistic tests after launching a missile that flew over Japan for the second time in a month. The overnight launch flew more than 2,200 miles, Japan's Chief Cabinet Secretary Yoshihide Suga said, and landed in the sea around 1,200 miles east of the island of Hokkaido. U.S. Secretary of State Rex Tillerson said that "continued provocations only deepen North Korea's diplomatic and economic isolation," and urged tougher sanctions. The U.N. Security Council was slated to meet Friday to discuss the issue. The Council on Monday had voted for new sanctions against North Korea. Elsewhere in markets, oil prices stabilized after settling at their highest level in more than six weeks on Thursday. West Texas Intermediate crude was up 0.6% Friday afternoon at $49.92 a barrel. This week's rally kicked off on signs of reduced global production. Global oil supplies have hit a snag in recent weeks as Hurricane Harvey limited U.S. output, while declining Middle East activity helped the Organization of Petroleum Exporting Countries keep to a previous deal to limit production. The weekly U.S. active oil-rig count also dropped by seven to 749, according to Baker Hughes. The total active U.S. rig count, including oil and natural-gas rigs, fell by eight to 936. In other market-moving news, U.S. August retail sales fell as weaker auto sales weighed on the headline number. Retail sales fell by 0.2% overall, but rose 0.2% when excluding autos, according to the Commerce Department. Motor-vehicle sales slumped 1.6% i-- their second-worst drop of the yea -- as Hurricane Harvey apparently dampened purchasing activity. Excluding autos and gas, retail sales fell 0.4%. "In the first of many indicators this fall to be impacted by hurricanes, the August retail-sales report showed the surge in gasoline sales was erased by the lost business from other categories in August," Wells Fargo economists said in a note. "In September, building-supply stores will likely see much stronger sales as Houston and the entire state of Florida rebuild and recover from major back-to-back storms." The fallout from Harvey also impacted U.S. industrial production, according to figures released Friday. The Federal Reserve said the measure unexpectedly declined 0.9% to a 104.7 reading in August -- the first drop since January. Economists anticipated a 0.1% increase after industrial production rose 0.4% in July. Meanwhile, capacity utilization fell to 76.1% in August from 76.9% in July. Elsewhere, business conditions in the New York region dipped in September, though at a narrower pace than expected. The Empire State Survey fell by 0.8 points to 24.4. Economists expected a sharper decline to 19. Meanwhile, U.S. consumer sentiment eased in September after hitting its highest level since January in August, according to the University of Michigan. The measure fell to 95.3 in September, a better reading than the expected 95.1. And lastly, the Census Bureau reported that U.S. business inventories rose by 0.2% in July to $1,873.9 billion, calming down after a 0.5% increase in June. July's increase came in as expected. Updated from 1:53 p.m. ET, Sept. 15.